Twitter is the newest craze in the Internets marketing industry. Even though there are other marketing strategies that exist, this new marketing method is working wonders. If you want to give it a try, you only need a Twitter account and the determination to make it succeed. You’ll soon see that you can spend less time and still get higher sales. So what is it about Twitter that makes it such a marketing miracle? With Twitter, you have the freedom to experiment with a variety of approaches to appeal to your target audience. 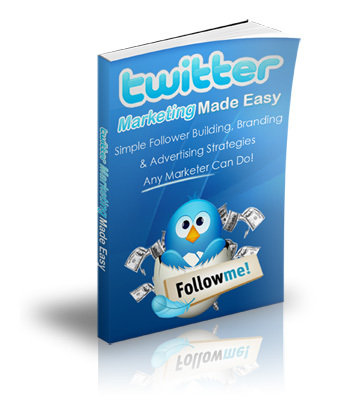 If you are new to twitter marketing and want to find out how you can make real money on twitter this is the eBook for you!